Hello! 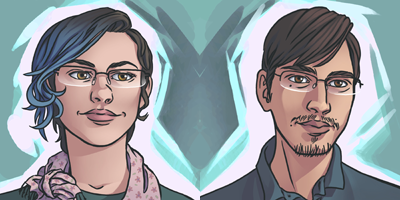 We’re Graham and Caroline Johnson, the pair behind Of Stars and Swords. We’re a young married couple that both graduated from the Fine Arts department at Flagler College in St. Augustine, Florida. For Of Stars and Swords, Graham handles the scripting, page layouts, and the lettering. Caroline does the heavy lifting with the pencils, traditional hand-inking, and finally digital coloring. If you enjoy what you see here, you can follow our art blog, Serious Turtle Studio. Art of all kinds ends up there, including other short comics we work on and a great deal of sketches and designs for Of Stars and Swords. You can see more of Caroline’s work on her Tumblr, and Graham has a blog, The Next Panel, where he talks about comics, craft, and art. If you’d like to get a hold of us, our Twitter accounts are over on the sidebar with our faces! We also have a Facebook Fan Page with a button right there as well. And if you prefer e-mail, they’re listed over on the left.